Last Summer twenty-five bear hunting hounds were killed by gray wolves protecting young pups in Wisconsin's unregulated hound training season on public lands. Every year, bear hunters are allowed to release hounds to chase, but not kill bears beginning July 1st-September 1st. In 26 seperate incidents, last year's wolf/bear hound fights occurred because hounds were released in wolf rendezvous areas, where young pups are taken by their family members to learn how to hunt and survive away from their dens. Since 2014, Wolf Patrol has been monitoring hunting practices in Wisconsin, such as the use of packs of up to six hounds to chase not just bears, but wolves too. Wolf Patrol's goal with this campaign is to maintain a physical encampment during the 2017 bear hound training season in northern Wisconsin. Last year, Wolf Patrol documented multiple hound hunting parties releasing their dogs into known areas where wolves had recently killed other dogs. These hunters willingly risk their dogs lives, knowing that if they are killed by wolves, the state of Wisconsin will compensate them up to $2,500 from the Endangered Species Fund. 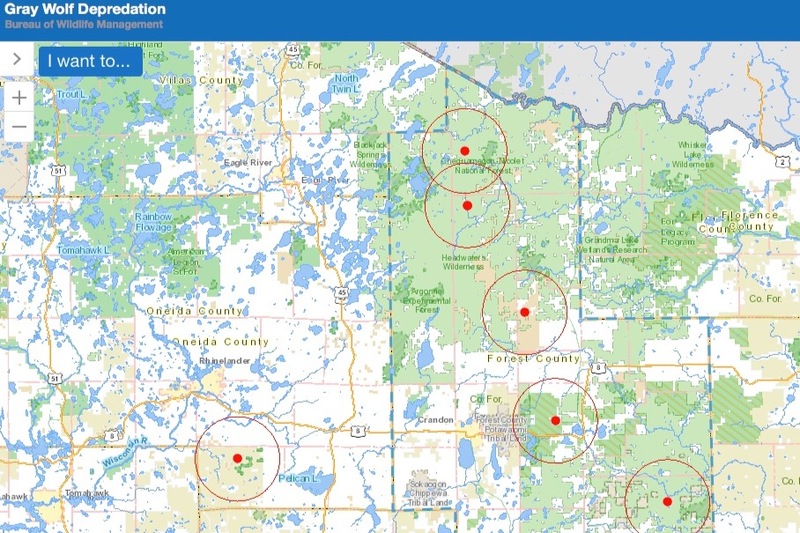 This Summer's monitoring encampment will be in the Chequamegon-Nicolet National Forest, where Wolf Patrol has also documented a high-density of bear baiting locations, which it has been proven, also attract wolves and other animals. Our encampment will give members of the public the opportunity to witness for themselves, the practice of training hounds to chase bears and other wildlife on public lands. Wolf Patrol crew members will also train citizens to collect data on baiting and hound hunting activities in the Chequamegon-Nicolet National Forest, which we will use to lobby for the end of bear baiting and hound hunting on national forest lands. The general public is welcome to visit our encampment, we invite everyone to come and discuss controversial hunting practices that negatively impact wolves and other animals. If you are unable to visit, please check out our wish list, which is full of neccesary items that will help make this Summer's campaign effective and successful. Wolf Patrol is a citizen-monitoring group comprised primarily of Wisconsin & Michigan residents. All volunteers are obligated to adhere to all local, state and federal laws, and work closely with state and federal wildlife agencies to help prevent illegal hunting activities. Come visit us the Summer and see for yourself what bear hunters in Wisconsin are doing on our national forest lands! Thank you to all our supporters who made monitoring of the 2018 Wisconsin's black bear hunt possible! This year's hunt was the source of multiple conflicts between wolves and bear hunting hounds, a total of twenty-one deadly fights took place, killing sixteen dogs and injuring an unknown number of wolves. Wolf Patrol is the only organization in the country opposing this conflict in the northwoods of Wisconsin, where it is happening. Our presence in the field has become a thorn in the side of hound hunters, who know that we are monitoring for illegal hunting activities in places where no other wolf groups dare to operate. Here's Part One of our update from the field, which begins in early June when bear baiting season begins. This film covers our monitoring of the first month of bear hound training season which began July 1st. 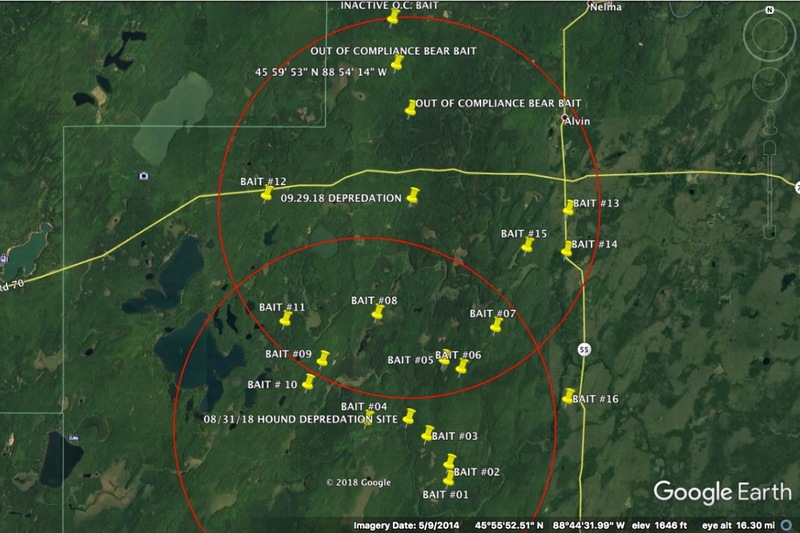 In addition to reporting multiple bear baits out of compliance to Wisconsin Department of Natural Resources, Wolf Patrol again documented the prolific bear baiting taking place in Wolf Caution Areas where bear hounds have been killed by wolves on public lands. We were also able to successfully assert our rights to maintain experimental bear baits in our efforts to document the impact intentional feeding has on black bears in this part of the Chequamegon-Nicolet National Forest, where DNR researchers found that 40% of a black bears diet is bear bait set out by humans. Only nine months ago, hound hunters in Wolf Patrol's operating area confronted our research team, illegally detaining and assaulting our patrol in their claim that we were breaking Wisconsin's unconstitutional hunter harassment laws. We responded with a video campaign highlighting the illegal and cruel practices associated with hound hunters in Wisconsin, that itself resulted in a criminal investigation of those featured in the videos. Not only did Wolf Patrol return, but Forest County Sheriff's deputies and DNR wardens also responded, helping us recover stolen trail cameras and bring out of compliance bear baits into compliance. We also distributed dog bells to two groups of hound hunters, which have been proven to help reduce conflicts between bear hounds and wolves. Wisconsin's black bear hunt may be over, but hound hunting in wolf territory will continue throughout the winter. Please consider supporting Wolf Patrol's efforts to protect the wolves of northern Wisconsin when making your holiday contributions! Only one organization is ever mentioned by trophy hunters as a threat to hound hunting in Wisconsin, and it is Wolf Patrol. Help us continue putting pressure on the US Forest Service and Wisconsin's Department of Natural Resources to reign in hound hunters in our national forests. And a big Thank You to everyone who continues to keep us on the top of that list! In June 2018, Wolf Patrol informed both the U.S. Forest Service (USFS) and Wisconsin's Department of Natural Resources (WDNR) of our prediction that Forest County, Wisconsin would be a hotspot for deadly conflicts between federally protected wolves and bear hunting hounds this year. We were right. On October 1, 2018 it was reported by WDNR that the fifth vicious fight between bear hounds and gray wolves occurred in portions of the Chequamegon-Nicolet National Forest in Forest County, where Wolf Patrol has also reported multiple bear baits out of compliance with WDNR regulations this Summer. This latest dog/wolf fight was the 20th since bear hound training season began on July 1, 2018. Wolf Patrol is the only organization in the country responding to the rise in deadly fights between bear hunting hounds and gray wolves in Wisconsin. For the last four consecutive bear hunting/training seasons, Wolf Patrol's citizen monitors have been in the field reporting illegal hunting activities to state and federal authorities, while also exposing these wildlife crimes to the public. I'm asking everyone who wants these conflicts stopped to support Wolf Patrol as we return to the killing grounds once more, to document and expose the threats to wolves in Wisconsin created by bear hunters. Our presence in active WDNR designated Wolf Caution Areas helps prevent more depredations from occurring, while also discouraging hound hunters from illegally retaliating against wolves that have killed their hunting dogs. With your support this week, we can continue to monitor hound hunting activities in Forest County's five Wolf Caution Areas and remind state and federal land managers of the conflicts created by Wisconsin's unregulated bear baiting and hound training seasons. Since Wisconsin's bear hound training season began on July 1st, Wolf Patrol has published 25 Public Service Announcement videos related to bear hunting practices in Wisconsin which can be viewed on our YouTube channel: Wolf Patrol. We've also reported over 8 illegal bear baits we discovered to WDNR conservation officers. Help us now as we return to the field to take a stand against the illegal and unethical hunting practices taking place on Wisconsin's national forest lands. There have been over twenty legalized dog fights between wolves and bear hounds on our national forest lands this year so far. Please help us by calling on USFS officials to end bear baiting and hound training in the Chequamegon-Nicolet National Forest, and by contributing to our monitoring campaign right now! We are back from our patrol of the opening weekend of the hound hunt for bear in Wisconsin! Although we will be returning, I wanted to take a moment to give our supporters an update of what transpired in the field. On the morning of September 16, 2018, Wolf Patrol was monitoring a bear hunting party as it operated from Highway 55 in portions of the Chequamegon-Nicolet National Forest in Forest County, Wisconsin. Our intentions, as told to Wisconsin Department of Natural Resources (WDNR) & US Forest Service law enforcement, isn't to follow any random hound hunting party we encounter, but those specifically operating in WDNR designated Wolf Caution Areas, where bear hounds have recently been killed by wolves. Our intention is not to harass or interfere with any law-abiding hunter. It is to monitor and document bear hunting practices that are contributing to deadly conflicts with federally protected wolves on public national forest lands. Every year, beginning with the opening days of Wisconsin's bear hound training season in July, bear hounds and wolves begin their own deadly fighting season, as bear hunters begin dumping food to attract bears and release their hounds to chase them. The wolves are attracted to the bear baits, as has been documented repeatedly over the years, and especially this Summer and Fall in particular. Many bear hunters in northern Wisconsin have posted trail camera captured photos of wolves at their bear baits this year. The smart bear hunters will abandon those baits, or at the very least not run their dogs off of baits visited by wolves. Once wolves have become accustomed to feeding from a bear bait, they will defend the location as a feeding area, challenging any other canine that enters the area. On September 16, as Wolf Patrol monitors were traveling south on Highway 55, a large bear hunting party was moving west, following hounds chasing a bear along the Pine River and into the McDonald Creek Wolf Caution Area established August 31, 2018 when wolves killed a bear hound in the area. We decided to return to the depredation area on Windsor Dam Road, where we believed the loose hounds were heading. As we left Highway 55, heading west on Pine River Road, a yearling bear cub ran out of the woods from the direction of the loose hounds. We continued to our destination, parking on the shoulder of Windsor Dam Road near the junction of Forest Road 2039, where the depredation occurred on 08/31/18. As we listened to the hounds move across Pine River and south of Wildcat Creek, another young bear came bolting out of the forest away from the loose hounds. Wolf Patrol remained in the area until the loose hounds were collected by the hound hunting party. The first portion of the above video is from this morning patrol. Later that day on September 16, Wolf Patrol responded to a Wisconsin resident's report of bear baits near a popular campground in the Chequamegon-Nicolet National Forest. The Chipmunk Rapids Campground is a favorite place to fish, cool off or fill up with spring water. Hound trucks were seen at the trailhead to Lost Lake, which is also the territory of a wolf family known by the same name. Fresh mud leaving a pull off 500 yards from the campground led Wolf Patrol monitors to a bear bait on Chipmunk Creek that was clearly out of compliance with WDNR bear baiting regulations. WDNR baiting regulations clearly state that "Bait must be enclosed and covered to prevent access to the bait material by deer." In addition, Florence County, where the bait is located, is one of 30 counties in Wisconsin under a total ban on using exposed bait for deer, due to the growing threat of Chronic Wasting Disease to Wisconsin's deer herd. Yet the bait at Chipmunk Creek had approximately four pounds of loose corn and grain spread around the hollowed out and capped log that was presumably filled with more bait. (Wolf Patrol monitors do not touch or tamper active bear baits or trail cameras on national forest lands, although we will document what is visible.) Approximately 20 feet from the spilled grain was another hole in the bank that had been filled with liquid bait consisting of oil, grease and other unknown materials. Wolf Patrol will be returning to the Chipmunk Rapids area in September to conduct a more thorough search of bear baits on national forest lands. Where there is one illegal bear bait, our experience has been that there are always more being operated by the same bear hunters. The bait was reported to WDNR's Violation Hotline on September 17, 2018. With gray wolves successfully returning to suitable habitat, and the growing popularity of hound hunting throughout Wisconsin, deadly conflicts between bear hounds and wolves are sure to continue. Wolf Patrol is asking Chequamegon-Nicolet National Forest officials to restrict and/or ban bear baiting and bear hound training on national forest lands. We are also asking for restrictions on bear hunting in known Wolf Caution Areas where bear hounds have already been killed by wolves. Thank you everyone who has responded to this year's bloody bear, wolf and bear hound slaughter in Wisconsin by supporting our efforts in the field! We are just a handful of volunteers operating only on your contributions. Please share this post with someone else you think might be able to support our efforts to protect wolves and bears in Wisconsin! An Update from Wolf Patrol's Cybercrime Division! Thanks to your continuing support, our Wildlife Crimes Division was able to save graphic evidence bear hunters published on Facebook, that they did not want the world to see. Here is the update. Please visit wolfpatrol.org for more information. These are the videos bear hunters don't want you to see. On June 26, 2018 Jamie Robertson posted a video on his Facebook page, "Bear Commander Kennels" of bear hounds chasing and fighting a young black bear during the 2017 bear hound training season in West Virginia. The video caused outrage in the hound hunting community, not because of the cruelty, but because it was shared on social media. Within days of the video being posted, it was removed. Hound hunters from Wisconsin and other states lobbied Robertson to remove the video from Facebook, posting his phone number and asking hound hunters to call and tell him the damage it could do to their "sport." Hound hunters know that running down bear and coyote with hounds is seen as unethical and cruel to much of the public, but thanks to the hound hunters' own Facebook pages, where they share videos of the cruelty and abuse, we know it is happening not only in Wisconsin, but West Virginia, Virginia, Michigan, Georgia, Mississippi, Maine, New York, North and South Carolina and a few other states as well. Remember, because Wisconsin does not require any license or registration to train hounds to chase bears every Summer, more and more non-resident hound hunters are coming to Wisconsin to harass bears before the kill season in their own states. Wolf Patrol will let you decide. Here we are posting not only the original Bear Commander Kennel training video, but other more recent videos of what can only be called animal abuse happening this Summer in not just Virginia, but Wisconsin's two month long bear hound training season as well. In addition, we are posting the Facebook comments that followed the Bear Commander video posting amongst the secret Facebook group that pressured Jamie Robertson into removing his video. Though not all of these videos were filmed in Wisconsin, they still reveal the dark truth behind hunting bear with hounds anywhere in the United States. Wonderful work Ron. Continue the fight against the ignorant mercenaries like Jack B Brown. Jack B Brown is a human entitlement parasite on the verge of extinction. Good-looking movie trailer. It's revealing to see the County Sheriff's Deputy misquoting the law and threatening arrest, apparently in order to harass the hunt monitors. I suppose the Deputy was able to claim ignorance of the law in order to avoid prosecution. Otherwise, this would seem to be illegal harassment of the hunt monitors by the Deputy. The law on "interference with hunting, fishing, or trapping" isn't really that complicated. It can be found by searching for "Wisconsin Statutes 29.083," including the prohibitions under item 2(a), especially 2(a)7. Thank you Ron for this interesting update and for the amazing work you are doing!! Keep on keepin' on!! Remember Rod; Everything you say or use will be used against you in a Court of Law...Good luck, Felon. Keep up the great work Rod and Wolf Patrol! I'm making a $ donation, but please send an application, as I would like to be a citizen monitor. Rod, thank you for your courageous work in the northern woods of WI, where desperado hounders plunder and terrorize the land and all its wildlife with unlimited baiting and unleashed dogs chasing everything that moves! You're doing great work, and let's hope that your group is recognized on a national level for standing up for non-consumptives who enjoy the wilderness WITHOUT baying hounds, loud trucks, and drunk dog handlers who think they own our national lands! After reading the self-entitled comments from the hunters on this campaign drive I have decided to donate again to Wolf Patrol. With love from Canada. Keep up the great work you do brother. Hope this message finds you well. Many Blessings..
To clarify, the 21-day limit isn't a limit on baiting. Sounds like it's the limit on using a campsite or leaving equipment in the National Forest? Bear baiting is allowed from April 15th through the bear-hunting season. Good work Ron, you are the best. When you meet with USFS , Bayfield Sherif etc. They should be made aware of your large cross section of supporters including LOHVWI.ORG, several active and retired Humane officers... also, if you have not yet net with GLIFWC staff such as Peter David or John Zorn. Zorn wrote an eloquent biologically based argument against the out of control Wolf Hunt two and three years ago. In Update 5, you wrote that "A DNR conservation warden has since explained that it is only illegal to have more than six dogs IN ACTUAL PURSUIT of a bear, but otherwise there is no limit on the number of dogs a hound hunter can have on the ground searching for scent." To the contrary, the 2017 WI Bear Hunting Regulations say that "it is illegal to hunt, train dogs or pursue bear with more than 6 dogs in a single pack, regardless of the number of bear hunters or the dog’s ownership." I think there was a solution here. I believe that it is illegal to run hounds after sunset. About 16 years ago a friend and I who were stargazing, were chased out of a field by hounds at about 10 pm. To this day I regret never having reported them since there were about 3 pickups traveling up and down at high speeds. Donate this amount to receive a Wolf Patrol t-shirt! Please specify SM, MD or LG. Animals have a right to life as much as humans. They are not murderers rapists or pedophiles, why should they be treated worse than those? Thank you for your witnessing this horrific "sport."